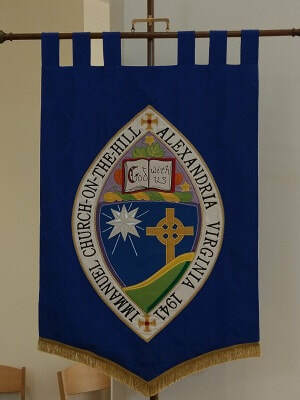 The banner of Immanuel Church-on-the-Hill was approved by the Vestry in June 2013. The star immediately below the words "Immanuel Church on-the-Hill": Immanuel - a sign that foretells "God is with us". The Jerusalem Crosslet: a recognized symbol of mission with Christianity spreading in all four directions. The seven pumpkins: a symbol of our commitment to community and outreach. The logo of Virginia Theological Seminary (representing Aspinwall Hall): recognition of our founding by -- and deep connection to -- the Virginia Theological Seminary. The banner design was developed by Wipple & Co., providers of church furnishings since 1789, based on initial concepts of parishioner Linda Serabian and Interim Rector the Rev. Canon Mary Sulerud. A second banner, donated by a parishioner, carries the seal of Immanuel Church-on-the-Hill. This banner was designed and produced by Trevor Floyd and Company for Immanuel.